Keeping equipment operators protected from the hazards of operating equipment can be as simple as installing a booth. Usable inside of factories and outside from development projects, operator booths keep employees safe and can be equipped with HVAC so employees can be kept comfortable. 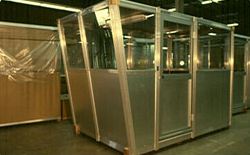 Shown here is a pre-assembled operator booth with a slanted wall. This booth will be mounted onto a mezzanine so that operators can get a clear view of equipment and personnel below.